Chloe Molloy won Collingwood's second AFLW Best and Fairest with a total of 66 votes. Image: AFL Photos. Rising Star Chloe Molloy has capped her outstanding debut season by taking home Collingwood’s AFLW Best and Fairest and Best First Year Player awards on Saturday night. Molloy’s stellar season has seen her already receive the NAB AFLW Rising Star and AFLPA Best First Year Player awards, All Australian honours and place second in the AFLW league Best and Fairest. Recruited at pick No. 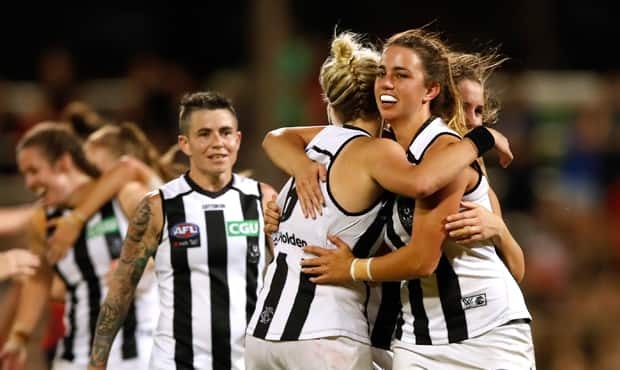 3 from the Calder Cannons’ forward line, the 19-year-old became a Pies defender in 2018 amassing 20 disposals in her Round 1 debut against Carlton. Molloy polled an AFLW club record 66 votes, ahead of forward Jasmine Garner (55) and equal third place winners Christina Bernardi and new recruit Jaimee Lambert (52). Garner shed 15kg at the beginning of the season to reinvent herself as a versatile defender or forward, taking 29 marks across her seven games this season. Former Western Bulldog Lambert found plenty of the ball in the Pies midfield, averaging 14.9 disposals in 2018. In her second season with the Pies, Bernardi established herself as a reliable target in the forward line. She took 30 marks during the season, with 11 of these taken inside 50. Converting was no issue with the All Australian Bernardi receiving the Leading Goal Kicker award after scoring an impressive nine goals, up from two in 2017.